Bunco® official Boardgame. Call this the highlight of the season, call it a rolling pad, or call it the new "twist" we've added _ Bunco®new official Boardgame. If a player rolls a Bunco® and any one of the die lands on the artwork in the corner shoe, eye, dancing woman, or diamond ring an additional Bunco® is awarded. One Dice game of Bunco® Boardgame is included in the Bunco® game, however, most groups like having the official Boardgame at every table. By popular demand we are offering the Boardgame as a seperate item for you group to purchase for each table. This is a new "twist" to add fun to the original Dice game of Bunco® . The Dice Game Bunco® new Boardgame is sweeping the nation. Order for your Bunco group today! 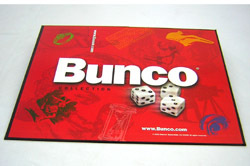 Bunco® Dice Game Boardgame is new and excisting addition and great for all tables. Remember when ordering the Bunco® Dice game with Boardgame at $34.95 you will receive ONE Boardgame. Usually ships within 24 hours.